Was it in the Crum Woods, on the Whispering Bench, or in Parrish Parlors? Love has blossomed in every corner of Swarthmore’s breathtaking campus. 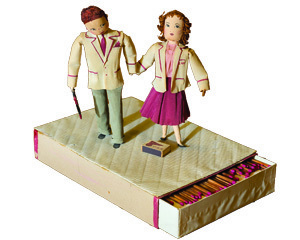 If you are among the 1,300 matchbox couples who have met, courted, fallen in love, and remained together, write us! Tell us about your romance in 350 words or fewer, and send us a matchbox photo—then or now. We’ll publish a selection of stories in our summer edition. Send via regular mail to Swarthmore College Bulletin, Swarthmore College, 500 College Ave., Swarthmore, PA 19081, or to bulletin@swarthmore.edu before April 1.